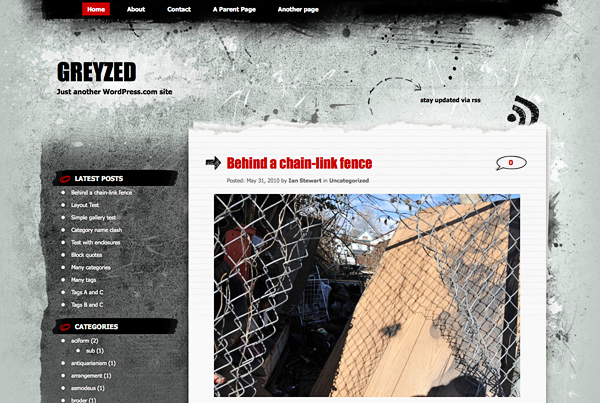 Today’s new theme is dirty and grungy-looking—but that’s just what makes it so good! Let’s take a look at Greyzed. While Greyzed might look rough it’s been carefully designed and it isn’t short on features. Starting at the top, it has a really sharp drop-down menu ready for our new menus feature. Visit Appearance → Menus and you can order the links here any way you like. The distinctive Greyzed design elements are repeated throughout your blog and finish off nicely at the bottom of each page with an optional extra-large widgetized footer in the same tough style. Visit Appearance → Widgets and add any Widget to Footer Left, Footer Middle, or Footer Right, to create your own unique footer. Greyzed is available today in your WordPress.com dashboard under Appearance → Themes and, for WordPress.org users, in the WordPress.org themes directory. I’m not convinced that I should change to this, but it is great! Different from what we have been getting lately. Nice one. Very Banksy-like and alternative! Really, really cool … I like it very much … grey, black and red is great for punk rock band blogs for example … gotta find a way use this one as soon as possible. I’d love it if it’s more colorful..
wow it looks insane. but not what i’m looking for. will you try some portfolio themes? some like the ones from “Themeforest” would be cool. I know, asking too much! Wow! That’s crazy good fun! I’m not wild about the footer widgets, but the color and tone and feel and taste of the overall theme are exciting! This does look sensational … but please … can we have some girly themes!? There are very few available … and … I am beginning to think that there are only males on the design team! We try and mix things up with the themes we launch here and—have no fear—there are more girly themes on the way. It seems to fit for boys only. I also would like to have some flowers or colors or… Please!!! We have some more colorful themes coming down the line. really what I have been looking for! Wow, this is simply amazing! And very unique too! Great to see this one, keep them coming! I don’t agree that it’s too boyish, I would love to find use for this one and I’m a girl. 😀 Maybe on one of my other blogs. Though I honestly feel there should be more black themes, there are hardly any good ones right now. I saw this as a Blogger theme, and CSS was available for WordPress. But I didn’t want to buy it, and the CSS upgrade. I love this theme though. Keep it up, WP. This theme is not the traditional one, I like it. As there are few colours, it is fine to put emphasis on pictures, Great. I’ll try it. Ian, can’t wait to see another one. More colorful, I hope. I think it would be cool if I could preview new themes from the announcement page here vs. having to navigate in the Dashboard to view a theme. I’m thinking Zombie Apocalypse, here. Very atmospheric, in that regard. If I do anything related to the inevitable zombie apocalpyse, I shall remember this theme. Hey, why are Black-LetterHead, Hemingway and Sunburn the only themes with really black backgrounds? I like it; it’s a little different than the kind that you usually have. Thanks so much! I could hug and kiss you lot! 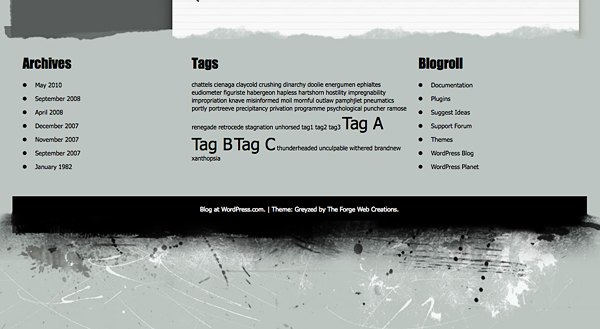 How did you know this was one of my all time favourite themes on Blogger? Only problem was, I couldn’t get Windows Live Writer to sync with it, so I am going to try it out now, and if it sync’s okay with your wordpress version, I will be switching to it straight away! I love this grunge look, its fantastic! It fits perfectly with my band’s website! Thanks! I activated this theme immediately. It’s wonderful. OH MY! This is the kind of theme I have been waiting for!!! Thank you SO much!! This theme is very unique. I’m certain this is not the theme for me but I hope other bloggers enjoy it! Wow, nice job! Having done a lot of graphic design and layout for print over the years, I gotta say this one looks great! I’m a girl and I adore this theme! First thing I thought when I saw it was “Call of Duty Nazi Zombies!” Fantastic job, guys. I’ll have to look into switching to this, but I’ll have to be in the right mood…I’m way too fond of my typewriter-keys header. Thanks so much. You guys rock. Looove this! Been looking for something a lil’ more me. Off to try it out asap! Triple great! Thanx sooooooooooo much. I love this grubby looking theme! A little in your face it is – kind of back alley and that is awesome. Thanks! I’m still tweaking my Enterprise ,,, which I love because of the gray. Now here comes another gray theme. What a feast. I’ll have to check out the features on this one, but at first glance, I love it! It is exactly my type, black, used worn out look. Red drop down menus like a shock. I am using it already, yay! That’s a great looking theme. I love the colors and the menus. Job well done. I just can’t help myself, Ive got to take this theme out for a spin! I think I need a 12 step program for theme changing. I was just loving the Twenty Ten now I’m off exploring a new Theme. Thank You WordPress! Looks good gonna give it a run. I love it!! It’s not a fit for what I do, but it is very edgy and youthful. Great Job! Wow, this is awesome! It definitely wouldn’t fit for my blog, but nonetheless is very cool. This is brilliant – I think my students (mostly girls!) will like this one! I love it. It’s not right for my audience, but I love it! Umm…wow. This may be the perfect fit for me. I’m gonna try messing with this. I like its design except the font of headings. Great theme guys. Keep up the good work! Love it—agree that it could do with a Twitter button somewhere (maybe with the RSS). That said, I use the Twitter Widget and would rather it was able to be displayed more prominently rather than the footer. rugged, tough and really steely.. I won’t be switching just yet but I must admit this puts a good spin on grunge! Nice. Just what I have been waiting for.. Thanks a lot!! Oh! I have been getting so many themes but none convinced me to change my theme from ChaoticSoul. This one simply rocks! Gives a retro kinda feel and good lucid reading guaranteed…the bubble for comment sections is too good. I have applied it. Thanks a ton. WOW! I’m definitely using this! This is great! It’s the kind of the theme I’ve been waiting for: a lot more young, and media themed! Good job! Different and edgy, some people will go wild for this one! It’s not for me, but I see others having fun with it. I love Greyzed! I am using it now. You guys really rock! I like its rugged appeal, awesome! Thanks! The best of all themes!!! Nice change from the norm! 😉 Catering for all. Beautiful design, though I wish people would start making more designs where users can upload their own graphic headers! More themes with custom headers are on the way. This is awesome. I’m loving that footer there!! More, more, more, more, more! Love this! Exactly what I was looking for… Switched immediately! I’ll definitely be considering this theme for my blog 🙂 Very nice work. Really like this one – after trying several of the recent additions this one seems to be to my liking more and I have updated it. Love the font style and the overall look of it – great addition. This theme looks pretty nice! I love the rocky look of the background, but I don’t think I’ll change to it. It doesn’t look like it’d go well with science and gaming posts. Awesome theme! are you guys going to make some darker themes soon? What would be really cool would be if a template like Greyed could take a custom header and somehow make it translucent so the design texture came through the background! I love all the new themes! Thank you! This theme instantly made me think of my husband’s blog. He’d love this. I am up for this kind of theme but since my blog is for professional use, I can’t use it. This theme is different though WP guys always come up with something big. I like it, The best thing is that the theme occupy my 15 inch Laptop screen which is what I like the most. Wow, love it! So much better than the plain ones and it’s really quirky. nice! makes me want to start another blog! My college students will love it! This is neat! I am a photographer and I have been searching for a free theme that displays my work nicely but also gives a nice fresh look to it and I haven’t found a theme yet. I like the style of this but it is a bit more masculine that I would like. Any chance you could do something like this but with a bit more feminine edge? Spooky, if you ask me. Yes! I love grungy themes! It’d be great to see another grunge theme with different color options or a customizable header. Keep the awesome themes rolling in! Very cool! Let’s make more like this! I really think it is a very cool theme. This theme is suitable for sports blogs especially some fighting sports. Honestly, I will not use this theme because it is not my cup of tea. This one is stylish. And I don’t find it too masculine either. Sadly, it’s not fitting with my blog (folktales) at all but this theme is still very awesome. Love the colors and the grittiness.